Left-wing groups tried to get approval for Arabs to build on the site of ancient Jewish village of Susya in the Hevron-region. An attempt by far-left Israeli groups to win approval for Arabs to build at the site of an ancient Jewish village has been rejected. The groups had sought construction approvals for land in Susya, in the Hevron region, immediately adjacent to the modern-day Jewish community of Susya. The Civil Administration rejected the request, and noted that the Arabs seeking to build have never proved ownership of the land. Following the decision to reject the request, demolition orders against structures at the site are expected to go into effect. 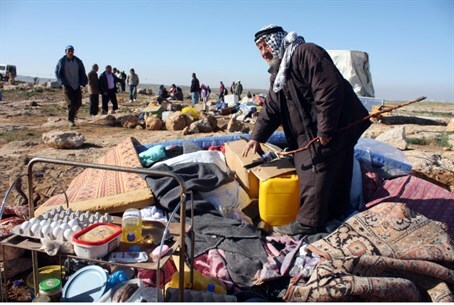 Palestinian Authority Arab activists had made an effort to claim Susya as “ancient Palestinian Susya,” according to the Tatzpit news agency. The activists had set up tents at the site and later built makeshift structures as part of their attempt to lay claim to the land. The makeshift village was backed by a media campaign on the part of EU-funded Israeli groups that attempted to convince Israelis that the land in question is rightfully Arab-owned. Israeli residents of the Hevron region expressed satisfaction at the Civil Administration’s decision. “The narrative that the left invented, that there was a village here that was evacuated due to the archaeological dig… is complete fiction and totally baseless,” he added. He noted that Palestinian Authority records dating back for many years list the Nawaja family, which has claimed residency in Susya, as living in the nearby PA Arab town of Yatta. “Law enforcement agencies must return them to their homes in Yatta, and not give legitimacy to criminals trying to create facts on the ground,” he concluded.